Brazil isn’t fair, and the world knows it. That’s why the next World Cup and Summer Olympics have been scheduled there – to give everyone an excuse to visit a country of ridiculous beauty! But how does one best find paradise in paradise? With so many stunning beaches, exquisite hotels, and exotic destinations to choose from, it takes tasteful help to fully enjoy maximum grandeur. SunsetVisitor.com is a hotel booking site that specializes in luxury hotels, boutique hotels, and resorts. 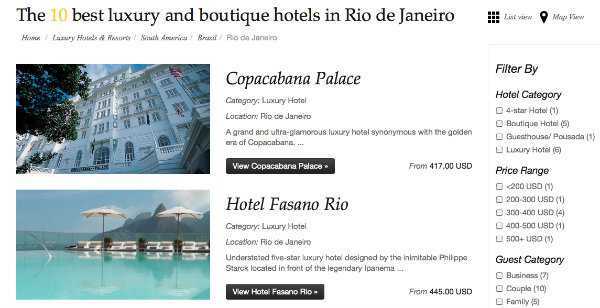 Just getting started, the website’s focus at the moment is on hotels and resorts in Brazil. Unlike other travel recommendation and booking engines that feature price comparisons or the lowest rates available, SunsetVisitor curates hand-picked accommodations: the best of the best, chosen by knowledgeable pros. Hotels are selected by Stephane and Rita Bouvier. Stephane traveled the world, working over 15 years in the airline industry and as a strategy consultant (mostly related to airline restructuring). He earned an MBA from the London Business School and also managed to live and work in over 20 countries. Rita, a Brazilian native, traveled the world as a model, becoming an expert in fashion, luxury and the best hotels. Stephane and Rita have not only tried to pick the top five world-class lodgings for each destination (more in larger cities like Rio de Janeiro, less in places like Iguazu Falls), but they have personally visited each property and independently reviewed the facilities. Despite technological advances, some destinations, like Brazil, remain problematic when planning a stay because booking websites cast too large a net, reflect commercial interests over guests’ satisfaction, and can’t cover all the intangibles such as current hotel infrastructure. The Bouviers know this from both experience and research, so they consider a variety of factors when paring their lists down to the greatest vacation packages. Their hands-on approach also translates into offering guests exclusive deals, heaven at a bargain if you will. 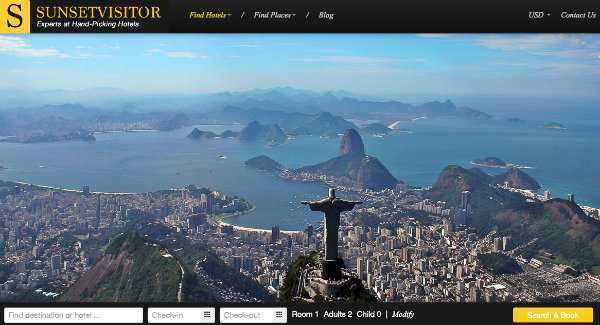 Guests that are more undecided can explore by destination (Rio de Janeiro, Sao Paulo, Iguazu Falls, Florianopolis, etc.) or according to the type of holiday that they’re in search of (adventure, beach, culture, eco-tourism, nightlife). The advantage of any kind of content curation is that it saves the less experienced the time and hassle of sifting through possibilities to find the most desirable options. You will not need to look at many pictures or reviews on SunsetVisitor (though it’s fair to warn that you’ll likely look at far more than your workday permits) to have complete faith in the Bouviers’ judgment. They’ve traveled, done their homework, and compiled listings of places to stay that would make royals drool at the dinner table. If you’re fortunate enough to be planning a stroll along Brazil’s famous beaches, SunsetVisitor can help you plan a stay of optimal splendor, in the style that bests suits each traveler – classic luxury (e.g. Copacabana Palace), tranquil elegance (La Maison Rio) or modern sophistication (Windsor Atlantica).